Conquer Colorado in this 2006 Jeep Grand Cherokee 4x4 with Remote Start, Power Windows and Door Locks, Cruise Control, Dependable 3.7L V6 Engine! Standard Laredo features include power windows and door locks, air conditioning, a power driver seat, split-folding rear seat, a reversible cargo floor with water-resistant storage and a CD stereo. The Laredo comes standard with a 3.7-liter V6 that produces 210 horsepower and 235 pound-feet of torque. 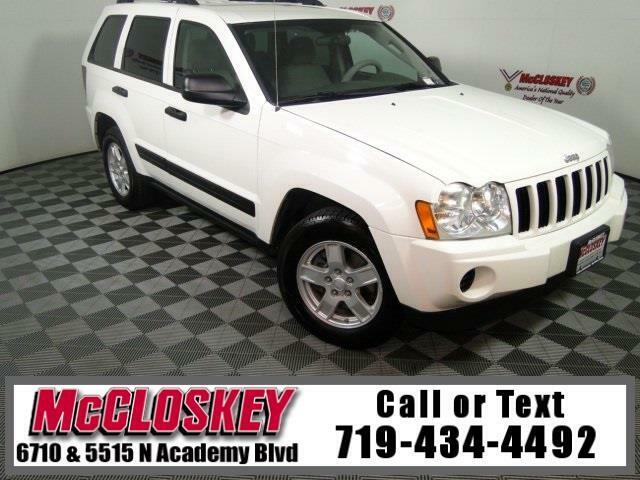 Smooth is the operative word when describing the 2006 Jeep Grand Cherokee. The suspension dampens imperfections in the road well, and the rack and pinion steering provides a solid and responsive road feel. This vehicle passed our 110 multi-point inspection and is backed by our National Quality Dealer of the Year Award. We are an ''A+'' Better Business Bureau Rated Business. We offer low interest rate financing, low down payments and the highest trade allowances in the state! Here at McCloskey we do things a bit differently, we shop our competition every day to ensure a great value to you. Come on down and experience it for yourself. This McCloskey Assured vehicle includes a 2 month/2000 mile Warranty and a Vehicle History Report!! At McCloskey we strive to provide ASSURANCE, TRUST, VALUE AND QUALITY! Call 719-434-4492.